The Mitsubishi A6M "Zero" is a long-range fighter aircraft formerly manufactured by Mitsubishi Aircraft Company, a part of Mitsubishi Heavy Industries, and operated by the Imperial Japanese Navy from 1940 to 1945. The A6M was designated as the Mitsubishi Navy Type 0 carrier fighter (零式艦上戦闘機, rei-shiki-kanjō-sentōki), or the Mitsubishi A6M Rei-sen. The A6M was usually referred to by its pilots as the Reisen (零戦, zero fighter), "0" being the last digit of the imperial year 2600 (1940) when it entered service with the Imperial Navy. The official Allied reporting name was "Zeke", although the use of the name "Zero" (from Type 0) was used colloquially by the Allies as well. The Zero is considered to have been the most capable carrier-based fighter in the world when it was introduced early in World War II, combining excellent maneuverability and very long range. The Imperial Japanese Navy Air Service (IJNAS) also frequently used it as a land-based fighter. In early combat operations, the Zero gained a legendary reputation as a dogfighter, achieving an outstanding kill ratio of 12 to 1, but by mid-1942 a combination of new tactics and the introduction of better equipment enabled Allied pilots to engage the Zero on generally equal terms. By 1943, due to inherent design weaknesses, such as a lack of hydraulic flaps and rudder rendering it extremely unmaneuverable at high speeds, and an inability to equip it with a more powerful aircraft engine, the Zero gradually became less effective against newer Allied fighters. By 1944, with opposing Allied fighters approaching its levels of maneuverability and consistently exceeding its firepower, armor, and speed, the A6M had largely become outdated as a fighter aircraft. However, as design delays and production difficulties hampered the introduction of newer Japanese aircraft models, the Zero continued to serve in a front line role until the end of the war in the Pacific. During the final phases, it was also adapted for use in kamikaze operations. Japan produced more Zeros than any other model of combat aircraft during the war. The Mitsubishi A5M fighter was just entering service in early 1937, when the Imperial Japanese Navy (IJN) started looking for its eventual replacement. On October 5, 1937, they issued "Planning Requirements for the Prototype 12-shi Carrier-based Fighter", sending it to Nakajima and Mitsubishi. Both firms started preliminary design work while they awaited more definitive requirements to be handed over in a few months. Based on the experiences of the A5M in China, the IJN sent out updated requirements in October calling for a speed of 270 kn (310 mph; 500 km/h) at 4,000 m (13,000 ft) and a climb to 3,000 m (9,800 ft) in 9.5 minutes. With drop tanks, they wanted an endurance of two hours at normal power, or six to eight hours at economical cruising speed. Armament was to consist of two 20 mm cannons, two 7.7 mm (.303 in) machine guns and two 60 kg (130 lb) bombs. A complete radio set was to be mounted in all aircraft, along with a radio direction finder for long-range navigation. The maneuverability was to be at least equal to that of the A5M, while the wingspan had to be less than 12 m (39 ft) to allow for use on aircraft carriers. All this was to be achieved with available engines, a significant design limitation. Nakajima's team considered the new requirements unachievable and pulled out of the competition in January. Mitsubishi's chief designer, Jiro Horikoshi, thought that the requirements could be met, but only if the aircraft were made as light as possible. Every possible weight-saving measure was incorporated into the design. Most of the aircraft was built of a new top-secret aluminium alloy developed by Sumitomo Metal Industries in 1936. Called "extra super duralumin" (ESD), it was lighter, stronger and more ductile than other alloys (e.g. 24S alloy) used at the time, but was prone to corrosive attack, which made it brittle. This detrimental effect was countered with an anti-corrosion coating applied after fabrication. No armour protection was provided for the pilot, engine or other critical points of the aircraft, and self-sealing fuel tanks, which were becoming common at the time, were not used. This made the Zero lighter, more maneuverable, and the longest-ranged single-engine fighter of World War II, which made it capable of searching out an enemy hundreds of kilometres away, bringing them to battle, then returning to its base or aircraft carrier. However, that tradeoff in weight and construction also made it prone to catching fire and exploding when struck by enemy rounds. With its low-wing cantilever monoplane layout, retractable, wide-set conventional landing gear and enclosed cockpit, the Zero was one of the most modern carrier based aircraft in the world at the time of its introduction. It had a fairly high-lift, low-speed wing with very low wing loading. This, combined with its light weight, resulted in a very low stalling speed of well below 60 kn (110 km/h; 69 mph). This was the main reason for its phenomenal maneuverability, allowing it to out-turn any Allied fighter of the time. Early models were fitted with servo tabs on the ailerons after pilots complained that control forces became too heavy at speeds above 300 kilometres per hour (190 mph). They were discontinued on later models after it was found that the lightened control forces were causing pilots to overstress the wings during vigorous maneuvers. It has been claimed that the Zero's design showed a clear influence from British and American fighter aircraft and components exported to Japan in the 1930s, and in particular on the American side, the Vought V-143 fighter. Chance Vought had sold the prototype for this aircraft and its plans to Japan in 1937. Eugene Wilson, president of Vought, claimed that when shown a captured Zero in 1943, he found that "There on the floor was the Vought V 142 [sic] or just the spitting image of it, Japanese-made", while the "power-plant installation was distinctly Chance Vought, the wheel stowage into the wing roots came from Northrop, and the Japanese designers had even copied the Navy inspection stamp from Pratt & Whitney type parts." While the sale of the V-143 was fully legal, Wilson later acknowledged the conflicts of interest that can arise whenever military technology is exported. Counterclaims maintain that there was no significant relationship between the V-143 (which was an unsuccessful design that had been rejected by the U.S. Army Air Corps and several export customers) and the Zero, with only a superficial similarity in layout. The Zero resembled the 1937 British Gloster F.5/34. Performance of the Gloster F.5/34 was comparable to that of early model Zeros, with its dimensions and appearance remarkably close to the Zero. Gloster had a relationship with the Japanese between the wars, with Nakajima building the carrier-based plane, the Gloster Gambet, under license. However allegations about the Zero being a copy have been discredited by some authors. In the official designation "A6M", the "A" signified a carrier-based fighter, "6" meant that it was the sixth such model built for the Imperial Navy, and "M" indicated Mitsubishi as the manufacturer. The official Allied code name was "Zeke", in keeping with the practice of giving male names to Japanese fighters, female names to bombers, bird names to gliders, and tree names to trainers. "Zeke" was part of the first batch of "hillbilly" code names assigned by Captain Frank T. McCoy of Nashville, Tennessee (assigned to the Allied Technical Air Intelligence Unit (ATAIU) at Eagle Farm Airport in Australia), who wanted quick, distinctive, easy-to-remember names. The Allied code for Japanese aircraft was introduced in 1942, and McCoy chose "Zeke" for the "Zero". Later, two variants of the fighter received their own code names. The Nakajima A6M2-N floatplane version of the Zero was called "Rufe", and the A6M3-32 variant was initially called "Hap". General "Hap" Arnold, commander of the USAAF, objected to that name, however, so it was changed to "Hamp". Captured examples were examined in New Guinea and the Allies realized that it was a variant of the Zero, so it was finally renamed "Zeke 32". The first Zeros (pre-series of 15 A6M2) went into operation with the 12th Rengo Kōkūtai in July 1940. On 13 September 1940, the Zeros scored their first air-to-air victories when 13 A6M2s led by Lieutenant Saburo Shindo attacked 27 Soviet-built Polikarpov I-15s and I-16s of the Chinese Nationalist Air Force, shooting down all the fighters without loss to themselves. By the time they were redeployed a year later, the Zeros had shot down 99 Chinese aircraft (266 according to other sources). At the time of the attack on Pearl Harbor, 521 Zeros were active in the Pacific, 328 in first-line units. The carrier-borne Model 21 was the type encountered by the Americans. Its tremendous range of over 2,600 kilometres (1,600 mi) allowed it to range farther from its carrier than expected, appearing over distant battlefronts and giving Allied commanders the impression that there were several times as many Zeros as actually existed. The Zero quickly gained a fearsome reputation. Thanks to a combination of unsurpassed maneuverability — compared to contemporary Axis fighters — and excellent firepower, it easily disposed of Allied aircraft sent against it in the Pacific in 1941. It proved a difficult opponent even for the Supermarine Spitfire. "The RAF pilots were trained in methods that were excellent against German and Italian equipment but suicide against the acrobatic Japs", as Lt.Gen. Claire Lee Chennault had to notice. Although not as fast as the British fighter, the Mitsubishi fighter could out-turn the Spitfire with ease, sustain a climb at a very steep angle, and stay in the air for three times as long. Allied pilots soon developed tactics to cope with the Zero. Due to its extreme agility, engaging a Zero in a traditional, turning dogfight was likely to be fatal. It was better to swoop down from above in a high-speed pass, fire a quick burst, then climb quickly back up to altitude. (A short burst of fire from heavy machine guns or cannon was often enough to bring down the fragile Zero.) Such "boom-and-zoom" tactics were used successfully in the China Burma India Theater (CBI) by the "Flying Tigers" of the American Volunteer Group (AVG) against similarly maneuverable Japanese Army aircraft such as the Nakajima Ki-27 Nate and Nakajima Ki-43 Oscar. AVG pilots were trained by their commander Claire Chennault to exploit the advantages of their P-40s, which were very sturdy, heavily armed, generally faster in a dive and level flight at low altitude, with a good rate of roll. Another important maneuver was Lieutenant Commander John S. "Jimmy" Thach's "Thach Weave", in which two fighters would fly about 60 m (200 ft) apart. If a Zero latched onto the tail of one of the fighters, the two aircraft would turn toward each other. If the Zero followed his original target through the turn, he would come into a position to be fired on by the target's wingman. This tactic was first used to good effect during the Battle of Midway and later over the Solomon Islands. Many highly experienced Japanese aviators were lost in combat, resulting in a progressive decline in quality, which became a significant factor in Allied successes. 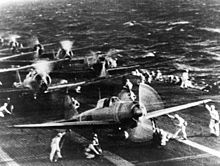 Unexpected heavy losses of pilots at the Battles of the Coral Sea and Midway dealt the Japanese carrier air force a blow from which it never fully recovered. Short film Recognition of the Japanese Zero Fighter (1943), intended to help U.S. airmen quickly distinguish the Zero from friendly aircraft, with Ronald Reagan as pilot Saunders. The fighter pilots are very disappointed with the performance and length of sustained fire power of the F4F-4 airplanes. The Zero fighters could easily outmaneuver and out-climb the F4F-3, and the consensus of fighter pilot opinion is that the F4F-4 is even more sluggish and slow than the F4F-3. It is also felt that it was a mistake to put 6 guns on the F4F-4 and thus to reduce the rounds per gun. Many of our fighters ran out of ammunition even before the Jap dive bombers arrived over our forces; these were experienced pilots, not novices. In the Coral Sea, they made all their approaches from the rear or high side and did relatively little damage because of our armor. It also is desired to call attention to the fact that there was an absence of the fancy stunting during pull outs or approaches for attacks. In this battle, the Japs dove in, made the attack and then immediately pulled out, taking advantage of their superior climb and maneuverability. In attacking fighters, the Zeros usually attacked from above rear at high speed and recovered by climbing vertically until they lost some speed and then pulled on through to complete a small loop of high wing over which placed them out of reach and in position for another attack. By reversing the turn sharply after each attack the leader may get a shot at the enemy while he is climbing away or head on into a scissor if the Jap turns to meet it. I had full confidence in my ability to destroy the Grumman and decided to finish off the enemy fighter with only my 7.7 mm machine guns. I turned the 20mm cannon switch to the 'off' position, and closed in. For some strange reason, even after I had poured about five or six hundred rounds of ammunition directly into the Grumman, the airplane did not fall, but kept on flying! I thought this very odd—it had never happened before—and closed the distance between the two airplanes until I could almost reach out and touch the Grumman. To my surprise, the Grumman's rudder and tail were torn to shreds, looking like an old torn piece of rag. With his plane in such condition, no wonder the pilot was unable to continue fighting! A Zero which had taken that many bullets would have been a ball of fire by now. When the powerfully armed Lockheed P-38 Lightning, armed with four "light barrel" AN/M2 .50 cal. Browning machine guns and one 20 mm autocannon, and the Grumman F6F Hellcat and Vought F4U Corsair, each with six AN/M2 heavy calibre Browning guns, appeared in the Pacific theater, the A6M, with its low-powered engine and lighter armament, was hard-pressed to remain competitive. In combat with an F6F or F4U, the only positive thing that could be said of the Zero at this stage of the war was that, in the hands of a skillful pilot, it could maneuver as well as most of its opponents. Nonetheless, in competent hands, the Zero could still be deadly. Due to shortages of high-powered aviation engines and problems with planned successor models, the Zero remained in production until 1945, with over 10,000 of all variants produced. The Akutan Zero is inspected by US military personnel on Akutan Island on 11 July 1942. The American military discovered many of the A6M's unique attributes when they recovered a largely intact specimen of an A6M2, the Akutan Zero, on Akutan Island in the Aleutians. During an air raid over Dutch Harbor on June 4, 1942, one A6M fighter was hit by ground-based anti-aircraft fire. Losing oil, Flight Petty Officer Tadayoshi Koga attempted an emergency landing on Akutan Island about 20 miles (32 km) northeast of Dutch Harbor, but his Zero flipped over on soft ground in a sudden crash-landing. Koga died instantly of head injuries (his neck was broken by the tremendous impact), but the relatively-undamaged fighter was found over a month later by an American salvage team and was shipped to Naval Air Station North Island, where testing flights of the repaired A6M revealed both strengths and deficiencies in design and performance. The experts who evaluated the captured Zero found that the plane weighed about 2,360 kg (5,200 lb) fully loaded, some 1,260 kg (2,780 lb) lighter than the F4F Wildcat, the standard United States Navy fighter of the time. The A6M's airframe was "built like a fine watch"; the Zero was constructed with flush rivets, and even the guns were flush with the wings. The instrument panel was a "marvel of simplicity ... with no superfluities to distract [the pilot]." What most impressed the experts was that the Zero's fuselage and wings were constructed in one piece, unlike the American method that built them separately and joined the two parts together. The Japanese method was much slower, but resulted in a very strong structure and improved close maneuverability. American test pilots found that the Zero's controls were "very light" at 320 km/h (200 mph), but stiffened at faster speeds (above 348 km/h (216 mph)) to safeguard against wing failure. The Zero could not keep up with Allied aircraft in high-speed maneuvers, and its low "never exceed speed" (VNE) made it vulnerable in a dive. While stable on the ground despite its light weight, the aircraft was designed purely for the attack role, emphasizing long range, maneuverability, and firepower at the expense of protection of its pilot. Most lacked self-sealing tanks and armor plating. Captain Eric Brown, the Chief Naval Test Pilot of the Royal Navy, recalled being impressed by the Zero during tests of captured aircraft. "I don't think I have ever flown a fighter that could match the rate of turn of the Zero. The Zero had ruled the roost totally and was the finest fighter in the world until mid-1943." The first two A6M1 prototypes were completed in March 1939, powered by the 580 kW (780 hp) Mitsubishi Zuisei 13 engine with a two-blade propeller. It first flew on 1 April, and passed testing within a remarkably short period. By September, it had already been accepted for Navy testing as the A6M1 Type 0 Carrier Fighter, with the only notable change being a switch to a three-bladed propeller to cure a vibration problem. While the navy was testing the first two prototypes, they suggested that the third be fitted with the 700 kW (940 hp) Nakajima Sakae 12 engine instead. Mitsubishi had its own engine of this class in the form of the Kinsei, so they were somewhat reluctant to use the Sakae. Nevertheless, when the first A6M2 was completed in January 1940, the Sakae's extra power pushed the performance of the Zero well past the original specifications. The new version was so promising that the Navy had 15 built and shipped to China before they had completed testing. They arrived in Manchuria in July 1940, and first saw combat over Chungking in August. There they proved to be completely untouchable by the Polikarpov I-16s and I-153s that had been such a problem for the A5Ms when in service. In one encounter, 13 Zeros shot down 27 I-15s and I-16s in under three minutes without loss. After hearing of these reports, the navy immediately ordered the A6M2 into production as the Type 0 Carrier Fighter, Model 11. Reports of the Zero's performance filtered back to the US slowly. There they were dismissed by most military officials, who thought it was impossible for the Japanese to build such an aircraft. A6M2 "Zero" Model 21 of Shōkaku prior to attack on Pearl Harbor, 7 December 1941. After the delivery of the 65th aircraft, a further change was worked into the production lines, which introduced folding wingtips to allow them to fit on aircraft carriers. The resulting Model 21 would become one of the most produced versions early in the war. A feature was the improved range with 520 l (140 US gal) wing tank and 320 l (85 US gal) drop tank. When the lines switched to updated models, 740 Model 21s had been completed by Mitsubishi, and another 800 by Nakajima. Two other versions of the Model 21 were built in small numbers, the Nakajima-built A6M2-N "Rufe" floatplane (based on the Model 11 with a slightly modified tail), and the A6M2-K two-seat trainer of which a total of 508 were built by Hitachi and the Sasebo Naval Air Arsenal. In 1941, Nakajima introduced the Sakae 21 engine, which used a two-speed supercharger for better altitude performance, and increased power to 840 kW (1,130 hp). A prototype Zero with the new engine was first flown on July 15, 1941. The new Sakae was slightly heavier and somewhat longer due to the larger supercharger, which moved the center of gravity too far forward on the existing airframe. To correct for this, the engine mountings were cut back by 185 mm (7.3 in) to move the engine toward the cockpit. This had the side effect of reducing the size of the main fuselage fuel tank (located between the engine and the cockpit) from 518 l (137 US gal) to 470 l (120 US gal). The cowling was redesigned to enlarge the cowl flaps, revise the oil cooler air intake, and move the carburetor air intake to the upper half of the cowling. The wings were redesigned to reduce span, eliminate the folding tips, and square off the wingtips. The inboard edge of the aileron was moved outboard by one rib, and the wing fuel tanks were enlarged accordingly to 420 l (110 US gal). The two 20 mm wing cannon were upgraded from the Type 99 Mark l to the Type 99 Mark II, which required a bulge in the sheet metal of the wing below each cannon. The wings also included larger ammunition boxes and thus allowing 100 rounds per cannon. The Sakae 21 engine and other changes increased maximum speed by only 11 km/h (6.8 mph) compared to the Model 21, but sacrificed nearly 1,000 km (620 mi) of range. Nevertheless, the navy accepted the type and it entered production in April 1942. The shorter wing span led to better roll, and the reduced drag allowed the diving speed to be increased to 670 km/h (420 mph). On the downside, turning and range, which were the strengths of the Model 21, suffered due to smaller ailerons, decreased lift and greater fuel consumption. The shorter range proved a significant limitation during the Solomons Campaign, during which Zeros based at Rabaul had to travel nearly to their maximum range to reach Guadalcanal and return. Consequently, the Model 32 was unsuited to that campaign and was used mainly for shorter range offensive missions and interception. The appearance of the redesigned A6M3-32 prompted the US to assign the Model 32 a new code name, "Hap". This name was short-lived, as a protest from USAAF Commanding General Henry "Hap" Arnold forced a change to "Hamp". Soon after, it was realized that it was simply a new model of the "Zeke" and was termed "Zeke 32". This variant was flown by only a small number of units, and only 343 were built. In order to correct the deficiencies of the Model 32, a new version with folding wingtips and redesigned wing was introduced. The fuel tanks were moved to the outer wings, fuel lines for a 330 l (87 US gal) drop tank were installed under each wing and the internal fuel capacity was increased to 570 l (150 US gal). More important, it regained back its capabilities for long operating ranges, similar to the previous A6M2 Model 21, which was vastly shortened by the Model 32. However, before the new design type was accepted formally by the Navy, the A6M3 Model 22 already stood ready for service in December 1942. Approximately 560 aircraft of the new type had been produced in the meantime by Mitsubishi Jukogyo K.K. According to a theory, the very late production Model 22 might have had wings similar to the shortened, rounded-tip wing of the Model 52. One plane of such arrangement was photographed at Lakunai Airfield ("Rabaul East") in the second half of 1943, and has been published widely in a number of Japanese books. While the engine cowling is the same of previous Model 32 and 22, the theory proposes that the plane is an early production Model 52. The Model 32, 22, 22 kou, 52, 52 kou and 52 otsu were all powered by the Nakajima 栄 (Sakae) 21型 engine. That engine kept its designation in spite of changes in the exhaust system for the Model 52. Mitsubishi is unable to state with certainty that it ever used the designation "A6M4" or model numbers for it. However, "A6M4" does appear in a translation of a captured Japanese memo from a Naval Air Technical Arsenal, titled Quarterly Report on Research Experiments, dated 1 October 1942. It mentions a "cross-section of the A6M4 intercooler" then being designed. Some researchers believe "A6M4" was applied to one or two prototype planes fitted with an experimental turbo-supercharged Sakae engine designed for high altitude. Mitsubishi's involvement in the project was probably quite limited or nil; the unmodified Sakae engine was made by Nakajima. The design and testing of the turbo-supercharger was the responsibility of the First Naval Air [Technical] Arsenal (第一海軍航空廠, Dai Ichi Kaigun Kōkūshō) at Yokosuka. At least one photo of a prototype plane exists. It shows a turbo unit mounted in the forward left fuselage. Lack of suitable alloys for use in the manufacture of a turbo-supercharger and its related ducting caused numerous ruptures, resulting in fires and poor performance. Consequently, further development of a turbo-supercharged A6M was cancelled. The lack of acceptance by the navy suggests that the navy did not bestow model number 41 or 42 formally, although it appears that the arsenal did use the designation "A6M4". The prototype engines nevertheless provided useful experience for future engine designs. Mitsubishi A6M5 Model 52s abandoned by the Japanese at the end of the war (Atsugi naval air base) and captured by US forces. Sometimes considered as the most effective variant, the Model 52 was developed to again shorten the wings to increase speed and dispense with the folding wing mechanism. In addition, ailerons, aileron trim tab and flaps were revised. Produced first by Mitsubishi, most Model 52s were made by Nakajima. The prototype was made in June 1943 by modifying an A6M3 and was first flown in August 1943. The first Model 52 is said in the handling manual to have production number 3904, which apparently refers to the prototype. Research by Mr. Bunzo Komine published by Mr. Kenji Miyazaki states that aircraft 3904 through 4103 had the same exhaust system and cowl flaps as on the Model 22. This is partially corroborated by two wrecks researched by Mr. Stan Gajda and Mr. L. G. Halls, production number 4007 and 4043, respectively. [verification needed][verification needed][verification needed] (The upper cowling was slightly redesigned from that of the Model 22.) An early production A6M5 Zero with non separated exhaust, with an A6M3 Model 22 in the background. A new exhaust system provided an increment of thrust by aiming the stacks aft and distributing them around the forward fuselage. The new exhaust system required "notched" cowl flaps and heat shields just aft of the stacks. (Note, however, that the handling manual translation states that the new style of exhaust commenced with number 3904. Whether this is correct, indicates retrofitting intentions, refers to the prototype but not to all subsequent planes, or is in error is not clear.) From production number 4274, the wing fuel tanks received carbon dioxide fire extinguishers. From number 4354, the radio became the Model 3, aerial Mark 1, and at that point it is said the antenna mast was shortened slightly. Through production number 4550, the lowest exhaust stacks were approximately the same length as those immediately above them. This caused hot exhaust to burn the forward edge of the landing gear doors and heat the tires. Therefore, from number 4551 Mitsubishi began to install shorter bottom stacks. Nakajima manufactured the Model 52 at its Koizumi plant in Gunma Prefecture. The A6M5 had a maximum speed of 565 km/h (351 mph)) at 6,000 m (20,000 ft) and reached that altitude in 7:01 minutes. A6M5a, Model 52甲 (Kō, 52a) – Starting at Mitsubishi number 4651, an armament change substituted the belt-fed Type 99-2 Mark 4 cannon, with 125 rounds per gun, in place of the drum-fed Type 99-2 Mark 3 cannon that carried 100 rounds per gun. Hence, the bulge in the underside of the wing for each cannon's ammunition drum was deleted and the ejection port for spent cartridge cases was moved. Thicker wing skinning was installed to permit higher diving speeds. A6M5b, Model 52乙 (Otsu, 52b) – Armament change: The 7.7 mm (.303 in) Type 97 gun (750 m/s (2,500 ft/s) muzzle velocity and 600 m (2,000 ft) range) in the right forward fuselage was replaced by a 13.2 mm Type 3 Browning-derived gun (790 m/s (2,600 ft/s) muzzle velocity and 900 m (3,000 ft) range, with a rate of fire of 800 rounds per minute) with 240 rounds. The larger weapon required an enlarged opening, creating a distinctive asymmetric appearance to the top of the cowling, and a revised gas outlet near the windscreen. In addition, each wing cannon received a fairing at the wing leading edge. A plate of armored glass 45 mm (1.8 in) thick was fitted to the windscreen. A larger propeller spinner was fitted, suggesting a change to the propeller. The type of ventral drop tank was changed, it now had fins and was suspended on a slanted pipe. The first of this variant was completed in April 1944 and it was produced until October 1944. A6M5c, Model 52丙 (Hei, 52c) – Armament change: One 13.2 mm (.51 in) Type 3 machine gun was added in each wing outboard of the cannon, and the 7.7 mm gun on the left side of the cowl was deleted. Four racks for rockets or small bombs were installed outboard of the 13 mm gun in each wing. Engine change: Some sources state that the hei had a Sakae 31 engine In addition, a 55 mm (2.2 in) thick piece of armored glass was installed at the headrest and an 8 mm (0.31 in) thick plate of armor was installed behind the seat. The mounting of the central 300 l (79 US gal) drop tank changed to a four-post design. Wing skin was thickened further. The first of this variant was completed in September 1944. Because of the gain in weight, this variant was used mainly for intercepting B-29s and special attack. A6M5-S (A6M5 Yakan Sentōki) – Armament change: To intercept B-29s and other night-flying aircraft, an air arsenal converted some Model 52s to night fighters. They were armed with one 20 mm Type 99 cannon behind the pilot, aimed upward, similar in intent to the Luftwaffe's Schräge Musik installation. However, lack of radar prevented them from being very effective. Some Model 21 and 52 aircraft were converted to "bakusen" (fighter-bombers) by mounting a bomb rack and 250 kg (550 lb) bomb in place of the centerline drop tank. Perhaps seven Model 52 planes were ostensibly converted into A6M5-K two-seat trainers. Mass production was contemplated by Hitachi, but not undertaken. Similar to the A6M6 but with the Sakae (now out of production) replaced by the Mitsubishi Kinsei 62 engine with 1,163 kW (1,560 hp), 60% more powerful than the engine of the A6M2. This resulted in an extensively modified cowling and nose for the aircraft. The carburetor intake was much larger, a long duct like that on the Nakajima B6N Tenzan was added, and a large spinner—like that on the Yokosuka D4Y Suisei with the Kinsei 62—was mounted. The larger cowling meant of the fuselage-mounted machine gun, armament change to 2x 13.2mm Type 3 machine gun in the fuselage and 4x 20mm Type99 Mark2 cannon (two on each wing). In addition, the Model 64 was modified to carry two 150 l (40 US gal) drop tanks on either wing in order to permit the mounting of a 250 kg (550 lb) bomb on the underside of the fuselage. Two prototypes were completed in April 1945 but the chaotic situation of Japanese industry and the end of the war obstructed the start of the ambitious program of production for 6,300 A6M8s, only the two prototypes being completed and flown. A6M Production: Nagoya, Mitsubishi Jukogyo K.K. A second A6M1 was completed on 17 March 1939, but was written off without explanation after completing the company's flight test program in July 1940. 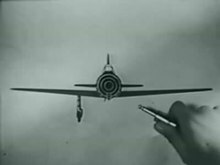 A6M Production: Ota, Nakajima Hikoki K.K. A6M Trainer Production: Chiba, Hitachi Kokuki K.K. and Omura, Dai-Nijuichi K.K. According to USSBS Report: 10,934 Figure includes: 10,094 A6M, 323 A6M2-N and 517 A6M-K builds. According to Francillon: 11,291 Figure includes: 10,449 A6M, 327 A6M2-N, 508 A6M2-K and 7 A6M5-K builds. A6M2 Model 21 on display at the Pacific Aviation Museum Pearl Harbor, Hawaii, United States. This aircraft was made airworthy in the early 1980s before it was grounded in 2002. An A6M at the National Museum of the USAF, painted to represent a section leader’s aircraft from the Japanese aircraft carrier Zuihō during the Battle of the Bismarck Sea. Like many surviving World War II Japanese aircraft, most surviving Zeros are made up of parts from multiple airframes. As a result, some are referred to by conflicting manufacturer serial numbers. In other cases, such as those recovered after decades in a wrecked condition, they have been reconstructed to the point that the majority of their structure is made up of modern parts. All of this means the identities of survivors can be difficult to confirm. Most flying Zeros have had their engines replaced with similar American units. Only one, the Planes of Fame Museum's A6M5, has the original Sakae engine. The rarity of flyable Zeros accounts for the use of single-seat North American T-6 Texans, with heavily modified fuselages and painted in Japanese markings, as substitutes for Zeros in the films Tora! Tora! Tora!, The Final Countdown, and many other television and film depictions of the aircraft, such as Baa Baa Black Sheep (renamed Black Sheep Squadron). One Model 52 was used during the production of Pearl Harbor. 840 – On display at the Australian Aviation Heritage Centre in Winnellie, Northern Territory. Wreckage of the forward fuselage, inboard wings, engine, and propeller. 5784 – On display at the Australian War Memorial in Canberra, Australian Capital Territory. A restored A6M2-21 "V-173" was retrieved as a wreck after the war and later found to have been flown by Saburō Sakai at Lae. Replica – On display at the Technik Museum Speyer in Speyer, Rhineland-Palatinate. Replica of the fuselage section on display at IWM London. Unknown serial number – The Museum Dirgantara Mandala in Yogyakarta has an A6M in its collection. 1493 – On display at the Kawaguchiko Motor Museum in Fujikawaguchiko, Yamanashi. 4168/4240/4241 – On display at the Yūshūkan in Chiyoda, Tokyo. 4685 – On display at Hamamatsu Air Base in Hamamatsu, Shizuoka. 4708 – On display at the Mitsubishi Heavy Industries Museum in Komaki, Aichi. 31870 – A two-seater on display at the National Museum of Nature and Science in Taito, Tokyo. 62343 – On display at the Chiran Peace Museum for Kamikaze Pilots in Chiran, Kagoshima. 82729 – On display at the Yamato Museum in Kure, Hiroshima. 91518 – On display at the Kawaguchiko Motor Museum in Fujikawaguchiko, Yamanashi. 92717 – On display at the Kawaguchiko Motor Museum in Fujikawaguchiko, Yamanashi. Replica – On display at MCAS Iwakuni in Iwakuni, Yamaguchi. Replica – Owned by businessman Masahide Ishizuka in Kanoya, Kagoshima. Airworthy, with a Pratt & Whitney R-1830 engine. 3835/3844 – On display at the Auckland War Memorial Museum in Auckland, Auckland Region. 196 – On display at the Imperial War Museum London in London, Greater London. Forward fuselage displayed. 3685 – On display at the Imperial War Museum Duxford in Duxford, Cambridgeshire. Fuselage displayed in unrestored condition. 1303 – In storage at the Flying Heritage Collection in Everett, Washington. 2266 – A small amount of wreckage from the Zero that crashed in the Niihau Incident is on display at the Pacific Aviation Museum in Honolulu, Hawaii. 3618 – In storage at Fantasy of Flight in Polk City, Florida. 3852 – Owned by the Flying Heritage Collection in Everett, Washington. This aircraft was recovered from Babo Airfield, Indonesia, and restored — first in Russia, then in California, and finally in Washington state — before being delivered to the Flying Heritage Collection. It has a P&W engine installed. 4043 – In storage at Fantasy of Flight in Polk City, Florida. Along with several other Zeros, this aircraft was recovered by the Australian War Memorial Museum in the early 1970s from Rabaul in the South Pacific. The markings suggest that it was in service after June 1943 and further investigation suggests that it has cockpit features associated with the Nakajima-built Model 52b. If this is correct, it is most likely one of the 123 aircraft lost by the Japanese during the assault of Rabaul. The aircraft was shipped in pieces to the attraction and it was eventually made up for display as a crashed aircraft. Much of the aircraft is usable for patterns and some of its parts can be restored to one day make this a basis for a flyable aircraft. 4340 – On display at the National Air and Space Museum in Washington, D.C.
4400 – In storage at the Flying Heritage Collection in Everett, Washington. 5356/5451 – On display at the Pacific Aviation Museum in Honolulu, Hawaii. This aircraft was formerly flown by the Commemorative Air Force after being restored by Robert Diemert. 5357 – Owned by the Planes of Fame Air Museum in Chino, California. This aircraft, 61-120, is the only airworthy example powered with an original Sakae radial engine. 5450 – On display at the National Naval Aviation Museum in Pensacola, Florida. 23186 – On display at the San Diego Air and Space Museum in San Diego, California. This aircraft is on loan from the National Air and Space Museum. The museum previously had another Zero in its collection, msn 4323, but it was destroyed in a fire on 22 February 1978. 51553 – On display at the National Museum of the United States Air Force in Dayton, Ohio. It was restored by Century Aviation. Replica – Owned by Warren Pietsch at the Texas Flying Legends Museum in Houston, Texas. This aircraft, known as the "Blayd" Zero, is a reconstruction based on templating original Zero components recovered from the South Pacific. To be considered a "restoration" and not a reproduction, the builders used a small fraction of parts from the original Zero landing gear in the reconstruction. It was built as a A6M2 Model 21. This aircraft was damaged in a ground accident on March 15, 2016, when a Goodyear FG-1D Corsair taxiing behind it overran the tail of the Zero, with the Corsair's propeller shredding roughly the last third of the Zero's fuselage and its control surfaces. Replica – Owned by the Southern California Wing of the Commemorative Air Force in Camarillo, California. This aircraft is an A6M3 that was recovered from Babo Airfield, Indonesia, in 1991. It was partially restored from several A6M3s in Russia, then brought to the United States for restoration. The aircraft was re-registered in 1998 and displayed at the Museum of Flying in Santa Monica, California. It uses a Pratt & Whitney R1830 engine. Replica – Under rebuild by Legend Flyers in Everett, Washington. This aircraft uses a small amount of parts from 3148. 2× 7.7 mm (.303 in) Type 97 aircraft machine guns in the engine cowling, with 500 rounds per gun. 2× 20 mm Type 99-1 cannon in the wings, with 60 rounds per gun. Nakajima Ki-43 Oscar, sometimes called the "Army Zero"
^ Note: In Japanese service carrier fighter units were referred to as Kanjō sentōkitai. ^ a b Taylan, Justin. "A6M3 Model 22 Zero Manufacture Number 3869 (Replica) Tail X-133". PacificWrecks.com. Pacific Wrecks Incorporated. Retrieved 23 February 2016. ^ Hawks, Chuck. "The Best Fighter Planes of World War II". chuckhawks.com. Retrieved: 18 January 2007. ^ a b Young 2013, p. 36. ^ a b Thompson with Smith 2008, p. 231. ^ Mersky, Peter B. (Cmdr. USNR). "Time of the Aces: Marine Pilots in the Solomons, 1942–1944." ibiblio.org. Retrieved: 18 January 2007. ^ Young, Edward M. (2013). F4F Wildcat vs A6M Zero-Sen: Pacific Theater 1942. Oxford, Great Britain: Osprey. p. 18. ISBN 978-1-78096-322-8 – via Google Books. ^ Francillon 1970, pp. 363–364. ^ Yoshio, Baba. "Extra super duralumin and successive aluminum alloys for aircraft." Journal of Japan Institute of Light Metals (Sumitomo Light Metal Ind. Ltd., Japan), Volume 39, Issue 5, pp. 378–395. Retrieved: 22 November 2015. ^ Tillman 1979, pp. 5, 6, 96. ^ Yoshimura 1996, p. 108. ^ a b c Fernandez 1983, pp. 107–108. ^ a b Angelucci and Bowers 1987, p. 436. ^ "The Mitsubishi A6M Zero ("Zeke")". www.faqs.org. ^ Air International October 1973, pp. 199–200. ^ Parshall and Tully 2007, p. 79. ^ a b c d Matricardi 2006, p. 88. ^ Glancey 2006, p. 170. ^ a b Francillon 1979, p. 365. ^ a b Gunston 1980, p. 162. ^ Rossi, J. R. "Chuck Older's Tale: Hammerhead Stalls and Snap Rolls, Written in the mid-1980s." AFG: American Volunteer Group, The Flying Tigers, 1998. Retrieved: 5 July 2011. ^ Holmes 2011, p. 314. ^ Thruelsen 1976, pp. 173, 174. ^ a b "Commander in Chief, Pacific Fleet report, Serial 01849 of 28 June 1942: USS Yorktown (CV-5) Action Report". Action Reports: Battle of Midway. Naval History and Heritage Command. 20 March 2018. Retrieved 18 March 2019. ^ Young 2013, pp. 6, 51, 82. ^ a b c d Wilcox 1942, p. 86. ^ "Saburo Sakai: 'Zero'." acepilots.com. Retrieved: 13 October 2010. ^ a b c Francillon 1979, p. 399. ^ a b Nohara 1993, p. 76. ^ a b c Nohara 1993, p. 51. ^ Reisen no Tsuioku (Model Art 883), 2013, p. 75. ^ a b Nohara 1993, pp. 76–77. ^ a b c Mechanic of World Aircraft Vol. 5, Koujinsha, 1994, pp. 220–221. ^ Nohara 1993, p. 78. ^ Mikesh 1994. p. 90. ^ Famous Airplanes of the World 9, 1993 p. 33. ^ a b "Quarterly Report on Research Experiments", Vol. 1, 30 March 1945. CINCPAC-CINCPOA Bulletin, Special Translation No. 52, No. 67–45, p. 14 D.
^ Mikesh 1981, p. 32. ^ "A6M4". J-Aircraft.com. Retrieved: 13 October 2010. ^ Mikesh 1994, p. 53. ^ Nohara 1993, p. 80. ^ Sekai no Kessaku Ki Vol. 9, pp. 57–59. ^ Sekai no Kessaku Ki Vol. 9, Bunrindou, 1993, p. 21. ^ Summary of Provisional Handling Instructions, February 1944, English translation. ^ Mikesh 1994, p. 115. ^ "Reisen Mushimegane", Fumetsu no Reisen, Maru, 2007. ^ Gajda, Stan. "The transitional Zero: New evidence that supports the theory." j-aircraft, 28 July 2010. Retrieved: 30 November 2015. ^ Halls, L.G. " The "Hybrid" Zero: More Evidence." j-aircraft, 9 September 2010. Retrieved: 30 November 2015. ^ Lansdale, Jim. "Transitional model of the Mitsubishi ReiSen 52 (A6M5): Part II." j-aircraft, 21 March 2010. Retrieved: 30 November 2015. ^ Sekai no Kessaku Ki, Vol. 9. pp. 57–59. ^ A6M5 Summary of Provisional Handling Instructions, February 1944 (translated) at 4-4. ^ A6M5 Summary of Provisional Handling Instructions, February 1944 (translated). p. 4-4. ^ Nohara 1993, p. 79. ^ Sekai no Kessaku Ki, Vol. 9 Bunrindou 1993, p. 23. ^ Sekai no Kessaku Ki, Vol. 9, Bunrindou, 1993, p. 24. ^ a b Sekai no Kessaku Ki, Vol. 9, Bunrindou, 1993, p. 22. ^ Sekai no Kessaku Ki, Vol. 9, Bunrindou. p. 77. ^ Nohara 1993, p. 82. ^ Mechanic of World Aircraft, Vol.5, Koujinsha, p. 220-221. ^ Sekai no Kessaku Ki, Vol. 9, Bunrindou, pp. 46–49. ^ Sekai no Kessaku Ki, Vol. 9 Bunrindou 1993 at 22. ^ Sekai no Kessaku Ki, Vol. 9, Bunrindou, 1993, p. 23. ^ Graham, Rob. "FAQ: Zero Night Fighter." j-aircraft.com. Retrieved: 30 November 2015. ^ Nohara 1993, p. 84. ^ Francillon 1970, pp. 374–375. ^ "Appendix D., pp. 124–125." Washington, D.C.: Corporation report, the United States Bombing Survey Aircraft Division, 1947. ^ FAOTW, 1996, p. 137. ^ Francillon 1979, pp. 364–365. ^ "Appendix M., pp. 40–42." Washington, D.C.: Corporation report, the United States Bombing Survey Aircraft Division, 1947. ^ "Appendix I., p. 42." Washington, D.C.: Corporation report, the United States Bombing Survey Aircraft Division, 1947. ^ "Appendix B., p. 6." Washington, D.C.: Corporation report, the United States Bombing Survey Aircraft Division, 1947. ^ Francillon 1979, p. 377. ^ Francillon 1979, p. 428. ^ Taylan, Justin. "A6M2 Model 21 Zero Manufacture Number 5356 Tail EII-102". PacificWrecks.com. Pacific Wrecks Incorporated. Retrieved 12 January 2012. ^ "Factsheets : Mitsubishi A6M2 Zero". National Museum of the USAF. Archived from the original on 13 January 2012. Retrieved 2 January 2012. ^ Seaman, Richard. "Aircraft air shows." richard-seaman.com. Retrieved: 13 October 2010. ^ "Mitsubishi Zero". Australian Aviation Heritage Centre. Australian Aviation Heritage Centre. Archived from the original on 29 February 2016. Retrieved 22 February 2016. ^ "Airframe Dossier – MitsubishiA6M, s/n 5349 IJNAF, c/n 840". Aerial Visuals. AerialVisuals.ca. Retrieved 22 February 2016. ^ "Mitsubishi A6M2 Model 21 Zero Fighter Aircraft : Japanese Navy Air Force". Australian War Memorial. Australian War Memorial. Retrieved 22 February 2016. ^ Taylan, Justin. "A6M2 Model 21 Zero Manufacture Number 5784 Tail V-173". PacificWrecks.com. Pacific Wrecks Incorporated. Retrieved 22 February 2016. ^ a b Smith 2015, p. 141. ^ "Airframe Dossier – MitsubishiA6M". Aerial Visuals. AerialVisuals.ca. Retrieved 22 February 2016. ^ "A6M Reisen "Zeke"". Preserved Axis Aircraft. ClassicWings.com. Retrieved 22 February 2016. ^ Taylan, Justin. "A6M5 Model 52 Zero Manufacture Number 1493". PacificWrecks.net. Pacific Wrecks Incorporated. Retrieved 29 February 2016. ^ Taylan, Justin. "A6M5 Model 52 Zero Manufacture Number 4168 Tail 81-161". PacificWrecks.com. Pacific Wrecks Incorporated. Retrieved 23 February 2016. ^ Taylan, Justin. "A6M5a Model 52ko Zero Manufacture Number 4685 Tail 43-188". PacificWrecks.com. Pacific Wrecks Incorporated. Retrieved 23 February 2016. ^ Taylan, Justin. "A6M5 Model 52 Ko Zero Manufacture Number 4708". PacificWrecks.com. Pacific Wrecks Incorporated. Retrieved 22 February 2016. ^ Taylan, Justin. "A6M2 Model 21 Zero Manufacture Number 31870 Tail 53-122". PacificWrecks.com. Pacific Wrecks Incorporated. Retrieved 22 February 2016. ^ Taylan, Justin. "A6M5c Model 52 Zero Manufacture Number 62343". PacificWrecks.com. Pacific Wrecks Incorporated. Retrieved 22 February 2016. ^ Taylan, Justin. "A6M7 Model 62 Zero Manufacture Number 82729 Tail 210-B-118". PacificWrecks.com. Pacific Wrecks Incorporated. Retrieved 22 February 2016. ^ Taylan, Justin. "A6M2 Model 21 Zero Manufacture Number 91518". PacificWrecks.net. Pacific Wrecks Incorporated. Retrieved 29 February 2016. ^ Taylan, Justin. "A6M2 Model 21 Zero Manufacture Number 92717". PacificWrecks.net. Pacific Wrecks Incorporated. Retrieved 29 February 2016. ^ Clark, Charlie (26 January 2012). ""Zero" hangar links present to past". Marines. Retrieved 22 February 2016. ^ Pack, Justin (16 February 2013). "Station scouts visit Zero Hangar". Stripes Japan. Retrieved 22 February 2016. ^ Yoshimura, Shigeo (6 November 2014). "Victory, as airworthy Zero fighter returns home after 70-year hiatus". The Asahi Shimbun. The Asahi Shimbun Company. Archived from the original on 3 March 2016. Retrieved 23 February 2016. ^ Toda, Miki (27 January 2016). "World War II Zero fighter flies over Japan". AP. Associated Press. Retrieved 23 February 2016. ^ Taylan, Justin. "A6M3 Model 22 Zero Manufacture Number 3858 (Replica)". PacificWrecks.com. Pacific Wrecks Incorporated. Retrieved 23 February 2016. ^ Taylan, Justin. "A6M3 Model 22 Zero Manufacture Number 3844 Tail 2-152". PacificWrecks.com. Pacific Wrecks Incorporated. Retrieved 22 February 2016. ^ "Airframe Dossier – Mitsubishi A6M5, s/n BI-05 IJNAF". Aerial Visuals. AerialVisuals.ca. Retrieved 22 February 2016. ^ Taylan, Justin. "A6M5 Model 52 Zero". PacificWrecks.com. Pacific Wrecks Incorporated. Retrieved 23 February 2016. ^ Goodall, Geoffrey (14 October 2014). 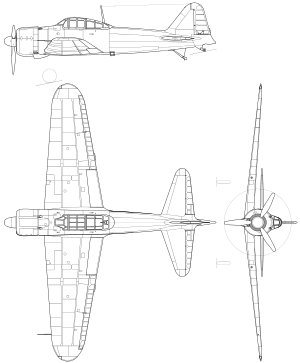 "MITSUBISHI A6M REISEN / ZERO-SEN ("ZEKE")" (PDF). Geoff Goodall's Aviation History Site. Geoffrey Goodall. Retrieved 23 February 2016. ^ Taylan, Justin. "A6M3 Model 22 Zero Manufacture Number 3685 Tail Y2-176". PacificWrecks.com. Pacific Wrecks Incorporated. Retrieved 23 February 2016. ^ Taylan, Justin. "A6M5 Model 52 Zero Manufacture Number 1303 Tail 61-121". PacificWrecks.com. Pacific Wrecks Incorporated. Retrieved 23 February 2016. ^ Taylan, Justin. "A6M2 Model 21 Zero Manufacture Number 2266 Tail BII-120". PacificWrecks.com. Pacific Wrecks Incorporated. Retrieved 22 February 2016. ^ Taylan, Justin. "A6M3 Model 22 Zero Manufacture Number 3618 Tail -133". PacificWrecks.com. Pacific Wrecks Incorporated. Retrieved 23 February 2016. ^ Taylan, Justin. "A6M3 Model 22 Zero Manufacture Number 3852 (Replica Two Seater)". PacificWrecks.com. Pacific Wrecks Incorporated. Retrieved 23 February 2016. ^ "Mitsubishi A6M3 Type 22 Zero". Century Aviation. Century Aviation. Retrieved 11 May 2016. ^ "MITSUBISHI A6M3-22 REISEN (ZERO)". Flying Heritage Collection. Friends of Flying Heritage. Archived from the original on 14 February 2016. Retrieved 22 February 2016. ^ "Zero". Fantasy of Flight. Archived from the original on 10 July 2011. Retrieved 4 March 2011. ^ Taylan, Justin. "A6M5 Model 52 Zero Manufacture Number 4043 Tail 3-108". PacificWrecks.com. Pacific Wrecks Incorporated. Retrieved 22 February 2016. ^ "Mitsubishi A6M5 Reisen (Zero Fighter) Model 52 ZEKE". Smithsonian National Air and Space Museum. Retrieved 22 February 2016. ^ Taylan, Justin. "A6M5 Model 52 Zero Manufacture Number 4400 Tail HK-102". PacificWrecks.com. Pacific Wrecks Incorporated. Retrieved 23 February 2016. ^ Taylan, Justin. "A6M2 Model 21 Zero Manufacture Number 5356 Tail EII-102". PacificWrecks.com. Pacific Wrecks Incorporated. Retrieved 22 February 2016. ^ cntnt01, default,0&cntnt01alias=A6M5&cntnt01returnid=128 "Mitsubishi A6M5" Check |url= value (help). Planes of Fame. Retrieved 23 February 2016. ^ "A6M2 ZERO". National Naval Aviation Museum. Naval Aviation Museum Foundation. Retrieved 22 February 2016. ^ Justin, Taylan. "A6M2 Model 21 Zero Manufacture Number 5450 Tail EII-140". PacificWrecks.com. Pacific Wrecks Incorporated. Retrieved 22 February 2016. ^ "Mitsubishi A6M7 Zero-sen". San Diego Air & Space Museum. Retrieved 22 February 2016. ^ Taylan, Justin. "A6M7 Model 62 Zero Manufacture Number 23186 Tail ヨ-143". PacificWrecks.com. Pacific Wrecks Incorporated. Retrieved 22 February 2016. ^ Taylan, Justin (August 7, 2015). "A6M5 Model 52 Zero Manufacture Number 4323". PacificWrecks.com. Pacific Wrecks Incorporated. Retrieved 22 February 2016. ^ "Mitsubishi A6M2 Zero". National Museum of the United States Air Force. April 20, 2015. Retrieved 22 February 2016. ^ Taylan, Justin. "A6M2 Model 21 Zero Manufacture Number 51553 Tail 313". PacificWrecks.com. Pacific Wrecks Incorporated. Retrieved 22 February 2016. ^ "1943 Mitsubishi A6M2 Type 21 Zero". Century Aviation. Century Aviation. Retrieved 11 May 2016. ^ "Blayd Corporation." pacificwrecks.com. Retrieved: 29 January 2007. ^ "Examination of Blayd Zero Artifacts." j-aircraft.com. Retrieved: 29 January 2007. ^ "Last Samurai A6M2 Model 21 Zero." Archived 13 December 2013 at the Wayback Machine Texas Flying Legends Museum. Retrieved: 8 December 2013. ^ Pietsch, Warren. "Museum Secrets." Texas Flying Legends Museum. Retrieved: 30 November 2015. 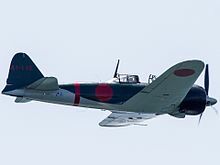 ^ "UPDATE: Original Japanese Zero Loses Tail". Retrieved 14 April 2016. ^ "NTSB accident report CEN16CA126A". ^ "MITSUBISHI A6M3 ZERO". Commemorative Air Force Southern California Wing. Commemorative Air Force, Inc. Retrieved 22 February 2016. ^ "Mitsubishi A6M3 Zero". Air Assets International. Airassets. Retrieved 29 February 2016. ^ "Legend Flyers Zero – Restoration Update". Warbirds News. 26 August 2015. Retrieved 29 February 2016. ^ "The Tale of a Zero Fighter – by Ron Cole". Warbirds News. 27 February 2014. Retrieved 29 February 2016. Fernandez, Ronald. Excess Profits: The Rise of United Technologies. Boston: Addison-Wesley, 1983. ISBN 978-0-201-10484-4. Ford, Douglas. "Informing Airmen? The U.S. Army Air Forces’ Intelligence on Japanese Fighter Tactics in the Pacific Theatre, 1941–5," International History Review 34 (Dec. 2012), 725–52. Francillon, R.J. Japanese Aircraft of the Pacific War. London: Putnam, 1970, ISBN 0-370-00033-1. Holmes, Tony, ed. Dogfight, The Greatest Air Duels of World War II. Oxford, UK: Osprey Publishing Ltd, 2011. ISBN 978-1-84908-482-6. Jablonski, Edward. Airwar. New York: Doubleday & Co., 1979. ISBN 0-385-14279-X. Matricardi, Paolo. Aerei Militari. Caccia e Ricognitori (in Italian). Milan: Mondadori Electa, 2006. Mikesh, Robert C. Warbird History: Zero, Combat & Development History of Japan's Legendary Mitsubishi A6M Zero Fighter. St. Paul, Minnesota: Motorbooks International, 1994. ISBN 0-87938-915-X. Mikesh, Robert C. Zero Fighter. New York: Crown Publishers, Inc., 1981; copyright Zokeisha Publications, Tokyo. ISBN 0-517-54260-9. Okumiya, Masatake and Jiro Horikoshi, with Martin Caidin. Zero! New York: E.P. Dutton & Co., 1956. Nijboer, Donald. Seafire Vs A6M Zero: Pacific Theatre. Oxford, UK: Osprey Publishing, 2009. ISBN 978-1-8460-3433-6. Nohara, Shigeru. Aero Detail 7: Mitsubishi A6M Zero Fighter. Tokyo: Dai-Nippon Kaiga Co. Ltd, 1993. ISBN 4-499-22608-2. Parshall, Jonathan and Anthony Tully. Shattered Sword: The Untold Story of the Battle of Midway. Washington, D.C.: Potomac Books Inc., 2007. ISBN 978-1-57488-924-6 (paperback). "Plane Facts: Zero-sen ancestry". Air International, October 1973, Vol 3 No 4. pp. 199–200. Smith, Peter C.Mitsubishi Zero: Japan's Legendary Fighter. Barnsley, South Yorkshire, UK: Pen & Sword Books, 2015. ISBN 978-1-7815-9319-6. Thruelsen, Richard. The Grumman Story. Praeger Press, 1976. ISBN 0-275-54260-2. Tillman, Barrett. Hellcat: The F6F in World War II. Naval Institute Press, 1979. ISBN 1-55750-991-3. United States Strategic Bombing Survey Aircraft Division. Mitsubishi Heavy Industries, Ltd. Corporation Report I, Washington, D.C. 1947. United States Strategic Bombing Survey Aircraft Division. Nakajima Aircraft Company, Ltd. Corporation Report II, Washington, D.C. 1947. United States Strategic Bombing Survey Aircraft Division. Hitachi Aircraft Company, Ltd. Corporation Report VII, Washington, D.C. 1947. United States Strategic Bombing Survey Aircraft Division. Army Air Arsenal and Navy Air Depots Corporation Report XIX, Washington, D.C. 1947. Wilcox, Richard. "The Zero: The first famed Japanese fighter captured intact reveals its secrets to U.S. Navy aerial experts". Life, 4 November 1942. Yoshimura, Akira, translated by Retsu Kaiho and Michael Gregson. Zero! Fighter. Westport, Connecticut: Praeger Publishers, 1996. ISBN 0-275-95355-6. Young, Edward M. F4F Wildcat vs A6M Zero-sen. Oxford, UK: Osprey, 2013. ISBN 978-1-7809-6322-8.